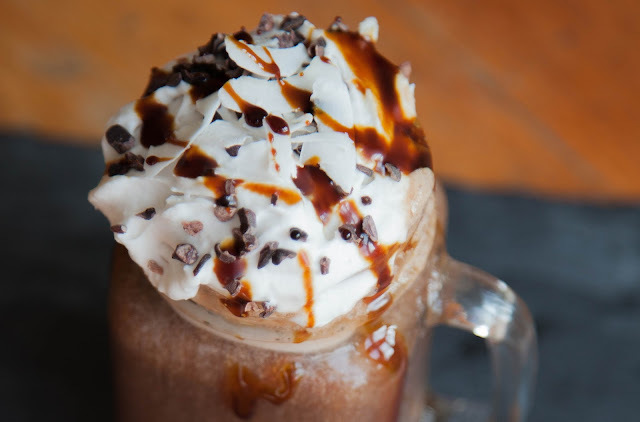 Just because you’re trying to eat healthily doesn’t mean you can’t enjoy a big frappe with lashings of whipped cream on top. Just substitute your usual dairy and refined sugar syrups to nutrient rich tasty alternatives and enjoy! -Simply blend together your espresso, banana and milk in a high speed blender till smooth and pour into a mason jar. -Using an electric whisk, whip up the coconut cream until it becomes light and fluffy. Then spoon the whipped cream on top of the Frappuccino drizzle with some choc shot and slurp away!